Hondon Villas are Winners in the "Pride of Spain Awards"
Category Winner in the "Pride of Spain Awards"
Hondon Villas are the worthy and proud winners of "The Business of the Year Award" arranged and presented via the #1 British Expatriate newspaper on the Costa Blanca South "The Costa Blanca People"... WELL DONE! 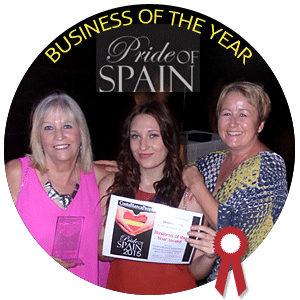 The British Expatriate Newspaper "Costa Blanca People" have awarded Maureen and the Hondon Villas team the "Business of the Year Award" in a formal presentation at the La Marquesa Golf Club in Quesada recently. Hondon Villas has been established in Spain for over 8 years and in that time has gone from strength to strength. Managing Director, Maureen Cook decided to use her vast years of experience as an estate agent in the UK to set up in here in Spain's Costa Blanca South. Although the work is hard, she always enjoys the work and finds helping and dealing with people's property aspirations very rewarding. Safe Buying in Hondon, Spain: Maureen holds here clients' hands throughout the process from looking for a home in Spain, right through until after completion and even helps with their day-to-day domestic practicalities such as NIEs, insurance, buying a car, setting up utilities and engaging local tradesmen. Maureen and the Hondon Villas team's whole ethos will often mean working all hours to ensure each and every client has the best possible service from printing boarding passes, arranging airport runs, hotel bookings, medical appointments and booking restaurants before they arrive in the Hondon Valley area. The Hondon Villas team can draw on bi-lingual staff and interpreters to accompany a client to the solicitors, doctors, police station or hospital. It's all done to make the client's BIG move less hassle and stress-free into a new area / country. Maureen has been surprised to be nominated for the "Pride of Spain Awards" as generally Spanish based Estate Agents have a bad reputation. So it is more pleasing to think that her clients and supporters have put her team up for an award. She says it cements her core belief that customer care, respect for others and her understanding of people's emotions and needs when they want to make that BIG MOVE whilst investing 100's of thousands of Euros is of the upmost importance. Maureen believes it is what defines her professionalism and can only come from years of experience and real life training. Not many agents can match that philosophy with her kindness, selfless dedication to people in the community. Judging by the positive comments and obvious support from her clients they want her and the Hondon Villas team to be recognised at these annual awards as a pillar of the community and a trusted local business. Over the last 12 months, Hondon Villas has moved to larger premises in the main Hondon Frailes Plaza, taken on more staff, collaborated with prominent real estate partners and built up a good standing locally. All the team are well know to the locals (it can be hard to walk down the streets without a cheery hello from a satisfied client). Above all, 2017 looks to be their best year so far with a record amount of properties coming through the books, more foot traffic and the online channels are receiving more visitors and enquiries than ever before. It would seem that for Hondon Villas the only way is up! Our main sites and social media channels: Hondon Villas for Sale | Hondon Valley Rentals | Our Hondon Blog. | Share on Facebook | Twitter Page | Google+ | We cover the Hondon Valley, Costa Blanca South, Spain.